Announcement 2019 Show Schedule will be posted soon! Stay tuned! 2019 Show Schedule will be posted soon! Stay tuned! This vase also arrived today and it was packaged very well. The vase is true to color and picture and it’s very pretty. This is also a gift for a friend out in Colorado and I know she will like it. The vase arrived today and it was packaged very well. It is beautiful and true to color of the picture. This is a gift for my daughter and I know she will love it. This baker is beautiful and bakes delicious bread. Shipping was prompt. Purchased another for a gift. Mugs, mugs and more mugs. Just finished carving 10 small bird baths. Twenty years of playing in mud. Our story of clay goes back to 1988 when I was in college at the Academy of Art in San Francisco, CA. I enrolled in a hand-building course and fell in love with the process of creating. At that time I was only interested in sculptural pieces and one of a kind items. I think that was mostly due to be in an art environment... certainly no one encouraged you to make the same item twice! Fast forward a few years and Eric and I found ourselves living on the Maine coast and looking for a more rewarding life than bartending and waitressing. He started his own lobstering business and I thought that maybe, just maybe clay might be in my future. So, I purchased a potters wheel and a little gas kiln. I signed up for a pottery making class at Watershed Center for the Ceramic Arts in Edgecomb, Me (very cool place and highly recommended for anyone wanting a great clay experience) for 8 weeks and learned to center clay and open it up to make bowls and cylinders. After class I ran home and practiced making more pots on my own wheel. Learning to fire pots in the kiln was a long challenge with many explosions and shard making along the path to finished work. 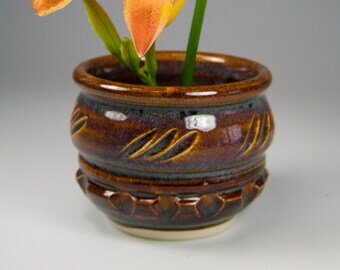 It took me another year of practice before I was making consistent looking pots that were actually sale-able. The learning is ongoing and there are so many techniques and firing practices I haven't yet tried but plan to in the future. We take as much care getting our pottery to you as we do making the pot itself. We understand that shipping costs are expensive and assure you that we've done our homework to choose the most inexpensive carrier available (USPS). Damage in transit: we need to know immediately! So, once it arrives please open and inspect it. If broken, SAVE ALL THE PIECES AS WELL AS PACKING MATERIAL. Important: take a photo of the damaged item and send to me. I'll do my best to replace that item immediately. Returns: I'm happy to accept returns on the pottery within 2 weeks of you receiving your item. Pottery must be in new, unused condition. There is a 25% restocking fee for returns. Buyer pays return shipping. Refund will be for the pottery, not the initial shipping charge. Packages shipping to Maine will be charged sales tax. We accept visa/mc and paypal. Special orders: I'll make the listing for you, after payment I will start the work and ship to you within 4 weeks. We ship with USPS and are very happy with the speed of delivery and care of the packages. Your pottery will be wrapped in new bubble wrap so please help the environment and re-use it or recycle it! Since we ship Priority Mail you will get your package quickly (three to four days). Also, unlike parcel post, Priority Mail gives a tracking number so you can see the progress of your package as it crosses the country. Your package will be insured for the full value of your pottery. International buyers: at this time we only ship a few of our smaller items internationally. We will ship First Class International with a customs declaration. You as the buyer are responsible for all duty, fees and taxes. No, I will not mark a package as "Gift" so you can avoid paying those fees as that is illegal. Delivery dates vary from one country to another. It could be as long as 3-4 weeks. Please understand it is out of our control. Please be sure to enter the correct shipping address. Customer will be responsible for all associated costs with re-shipping to a new address. Returns: we will accept returns within two weeks but you must email us ahead of time letting us know you are returning it. There is a 25% restocking fee on returns. You are responsible for return shipping costs. Our work is 100% handmade so each piece will vary slightly. Sizes given in each listing are approximate. We do our best but handmade is indeed handmade! Mugs especially are not identical as they may vary by an inch or two in height or base width.